This photo of the stunning total lunar eclipse of Oct. 27, 2004 (the night the Red Sox won the world series) was captured with a Nikon n8008 camera, one of the only SLRs ever made that can take unlimited multiple exposures. The image was created by snapping ~37 exposures approx. every six minutes for the duration of the eclipse. 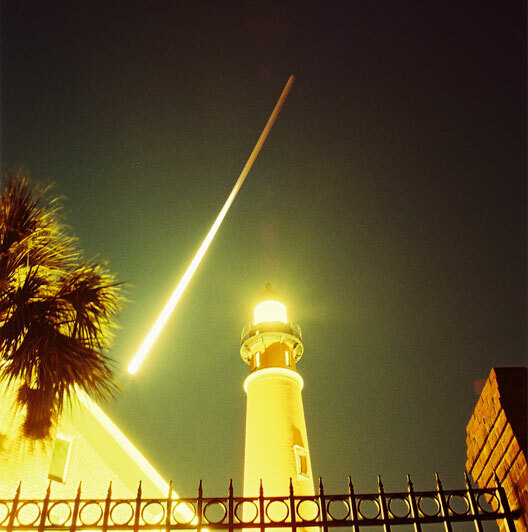 The film was never advanced, so all 37 images were captured on the same film negative frame (the lighthouse was captured all 37 times as well; it is not a composite photo). The addition of 37 short exposures combined is the equivalent of a lengthy nighttime exposure of the lighthouse (roughly 40 seconds total). 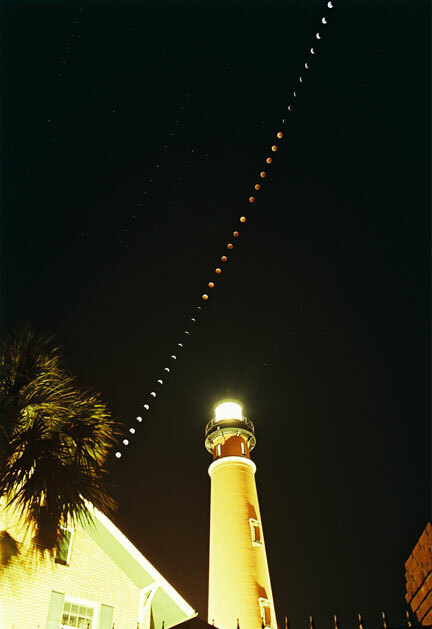 Below, a composite of separate closeup exposures of the sequence, and a timelapse of half the eclipse.